If you haven't already seen the interactive, animated map that shows station activity for Capital Bikeshare stations, be sure to check it out here. 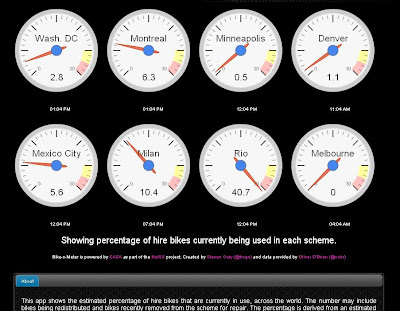 Following on that, and using the same data, a new app created by Steven Gray, called Bike-o-Meter, is also providing useful real-time data on bikesharing systems from around the world. Each of the dials shows the percentage of total bikes in use at that particular moment in time. It is not able to differentiate between bikes that are actually being ridden and those that may be in transit for relocation or taken out for servicing. However, it uses the maximum number of bikes in the system within the last 24 hours--not the advertised total number of bikes owned by the service--as the denominator in the calculation. Here's a bigger screenshot showing 2.8% of Capital Bikeshare's bikes in use at 1:04 PM on Wednesday, October 27. I noticed that Barcelona's usage rate at 7:00 PM was 22%. There were about 4500 bikes in service in Barcelona at that time, so that's almost 1000 bikes in use. Wow! Click on either graphic for a larger view.